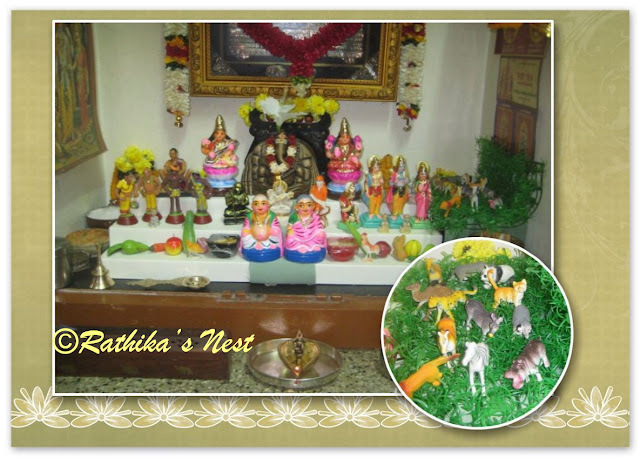 In Tamil Nadu, Navarathri or Dussera is synonymous with ‘Kolu’ (கொலு) – a tradition of arranging dolls of Gods and Goddesses, flanked by humans, animals and aquatic forms on steps, conveying the message of ‘Vasudeva kudumbakam’(equality of all beings). During my growing up years, we used to have an elaborate kolu arrangement involving 7-9 steps along with a park, pond and even a small hill with a temple atop! Animals were arranged in the park, which was covered by sprouting mustard plants to provide green cover. Fishes and other aquatic forms floated in the pond, while dolls of women fetching water in pots were kept near the pond. A doll set of wedding procession (கல்யாண ஊர்வலம்) occupied the surrounding road that led to the temple, with a ‘kutcheri’ (கச்சேரி) set completing the picture! One room was exclusively allotted for kolu during Navarathri. We do not have this luxury these days, given the space constraint and limited time. Hence, I have decided to go for a 'mini kolu' occupying just about 23” length, 9” depth and 4” height, complete with Chettiar kadai (செட்டியார் கடை) and an animal park! I used ‘plastic cupboard space organizer (2 no)’ for the steps!! What’s more, the whole kolu just fitted into my Pooja cupboard!!! 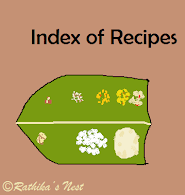 Click here for more information on Kolu, Navarathri recipes and Dussera celebrations!